The government workplace is undergoing a huge shift. See how designers have helped harness the change in the new Boston Public Schools offices. The Bruce C. Bolling Municipal building, new home of Boston Public School headquarters, is easily accessible by public transportation and located in the geographical center of the city. Photo by Anton Grassl of Esto. What comes to mind when you picture a government office? People wearing gray suits, toiling away behind a cubicle desk stacked high with paperwork? In actuality, the government workplace is undergoing a huge shift, embracing collaboration through design and tearing down the cubicle walls to be more flexible, open, and forward-thinking. 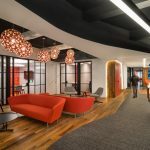 While many companies in other industries have already shifted to a more open, collaborative workspace, government offices are just starting to embrace this design change. Workplaces across industries are moving to open office layouts to foster teamwork and creativity, bringing employees together in frequent collaboration. They find that open offices can promote greater health, happiness, and productivity for employees by providing more access to natural light and varied working environments that encourage employees to move throughout the day. Further, open workspaces can reduce real estate costs, which is welcome in any industry — private or public. While redesigning a workspace can be a large financial investment, it’s one that pays off in re-orienting both the physical environment and work culture toward more collaborative and healthy ways of working. Communal kitchens with café tables encourage varied uses throughout the day. Photo by Anton Grassl of Esto. The City of Boston was presented with the opportunity to rethink the office space of Boston Public Schools (BPS) — the oldest school department in the country — as they relocated and centralized departments within a new building in Dudley Square, a streetcar neighborhood that thrived in the early twentieth century with retail stores like the iconic Ferdinand, New England’s largest furniture retailer of its time. The neighborhood was challenged by disinvestment in the 1980s after losing residents and businesses to the suburbs. Under the late Mayor Thomas M. Menino, the City’s Dudley Square Vision Project was launched to revive the community. In this effort, the city commissioned the new BPS headquarters, a design by Mecanoo Architecten and Sasaki Associates; the newly renamed Bruce C. Bolling Municipal Building was built in collaboration with Shawmut Construction, PMA Consultants, Boston’s Property and Construction Management Department (PCMD), the Boston Redevelopment Authority (BRA), and the City of Boston. A diversity of meeting areas abound, from conference rooms to open gathering spaces. Photo by Anton Grassl of Esto. In undertaking this project the first step was to think about what BPS most needed out of a new office space. The project team sought to understand unique user needs, considering the work habits of BPS employees while focusing on the families that BPS serves on a daily basis. Part of this process involved designing a temporary office space in Boston City Hall for BPS employees to test out early in the process and offer feedback to inform the ultimate design. Light floods in on all floors from the many vertical windows throughout. Photo by Anton Grassl of Esto. In the era of the open office, it is important to consider the variety of work experiences that employees will encounter each day, and in turn provide a variety of spaces for different tasks and work styles. A bright and airy open office layout welcomed more than 500 BPS employees in their move to Dudley Square, leaving behind the high-walled cubicles and cloistered space of the former office. While it took time for employees to get settled, the transition to open-office plan was made easier because this design balances open workspaces with private, quieter spaces for employees to focus. The design team did not believe employees should not be limited to one space. Instead, they expanded BPS workspace options beyond a single desk by offering soft-seating huddle spaces, conference rooms, window seating, outdoor café tables, and more. This balanced design breeds greater interaction and teamwork while preserving individual productivity. BPS employees and the public can enjoy this rooftop deck with panoramic views of the Boston skyline. Photo by Anton Grassl of Esto. The design team wanted to meet the needs of employees while also focusing on the needs of the community in Dudley Square. In a building that is public-facing it was important to have spaces for everyone to use within the building, to avoid becoming just beacon of bureaucracy within the community. The ground floor is designed for gatherings, retail, and dining while the second floor is open to the public, outfitted with meeting rooms for the school department and parents to interact and for the public to access. The sixth floor includes public meeting spaces and a green roof terrace open to all Boston residents and available for special events. The building’s new design embodies the connection the design team wanted to facilitate between these government employees and the community they serve. Touchdown spaces and soft seating allow employees to step away from their desks. Photo by Anton Grassl of Esto. Boston needed a new headquarters for BPS, but this project was about much more than a newly designed office space for the department’s hard-working employees. It was the perfect opportunity to revitalize the neighborhood and strengthen the sense of community in Dudley Square, catalyzing development in the process. In its newest incarnation, the building has been named the Bruce C. Bolling Municipal Building after the first black president of the Boston City Council. It is the first new government administrative office built in Boston since City Hall in the 1960s. The Roxbury Innovation Center, spearheaded by Mayor Martin Walsh, will soon open its doors on the second floor of the building, serving as a new space for area innovators, entrepreneurs and business founders to meet and collaborate, as well as partake in programs and workshops. New employees will support local businesses, and the bustling square will be getting new transit enhancements, bike lanes, and pedestrian crossings. The building has gone from an emblem of the past to a cornerstone for the future – the future of Dudley Square, the future of Boston’s public school system, and the future of workplace design. The story of a global design firm's evolution.